Arlington House, Arlington, Virginia. Photo: NPS files. The term "stucco" is used here to describe a type of exterior plaster applied as a two-or-three part coating directly onto masonry, or applied over wood or metal lath to a log or wood frame structure. Stucco is found in many forms on historic structures throughout the United States. It is so common, in fact, that it frequently goes unnoticed, and is often disguised or used to imitate another material. Historic stucco is also sometimes incorrectly viewed as a sacrificial coating, and consequently removed to reveal stone, brick or logs that historically were never intended to be exposed. Age and lack of maintenance hasten the deterioration of many historic stucco buildings. Like most historic building materials, stucco is at the mercy of the elements, and even though it is a protective coating, it is particularly susceptible to water damage. Stucco is a material of deceptive simplicity: in most cases its repair should not be undertaken by a property owner unfamiliar with the art of plastering. Successful stucco repair requires the skill and experience of a professional plasterer. Therefore, this Brief has been prepared to provide background information on the nature and components of traditional stucco, as well as offer guidance on proper maintenance and repairs. The Brief will outline the requirements for stucco repair, and, when necessary, replacement. Although several stucco mixes representative of different periods are provided here for reference, this Brief does not include specifications for carrying out repair projects. Each project is unique, with its own set of problems that require individual solutions. 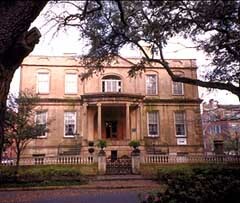 The stucco on the early-19th century Richardson-Owens-Thomas House in Savannah, Georgia, is a type of natural cement. Photo: NPS files. Stucco is primarily used on residential buildings and relatively small-scale commercial structures. Some of the earliest stucco buildings in the United States include examples of the Federal, Greek and Gothic Revival styles of the eighteenth and the nineteenth centuries that emulated European architectural fashions. Benjamin Henry Latrobe, appointed by Thomas Jefferson as Surveyor of Public Buildings of the United States in 1803, was responsible for the design of a number of important stucco buildings, including St. John's Church (1816), in Washington, D.C. 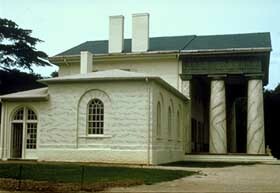 The stucco finish on Arlington House, Arlington, Virginia, was marbleized in the 1850s, approximately 30 years after it was built. Photo: NPS files. Nearly half a century later Andrew Jackson Downing also advocated the use of stucco in his influential book The Architecture of Country Houses, published in 1850. In Downing's opinion, stucco was superior in many respects to plain brick or stone because it was cheaper, warmer and dryer, and could be "agreeably" tinted. As a result of his advice, stuccoed Italianate style urban and suburban villas proliferated in many parts of the country during the third quarter of the nineteenth century. The damage to this stucco appears to be caused by moisture infiltration. Photo: NPS files. 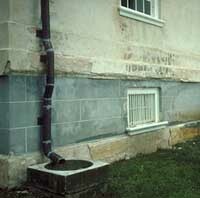 Caulking is not an appropriate method for repairing cracks in historic stucco. Photo: NPS files. The appearance of much stucco was determined by the color of the sand—or sometimes burnt clay—used in the mix, but often stucco was also tinted with natural pigments, or the surface whitewashed or color-washed after stuccoing was completed. Brick dust could provide color, and other coloring materials that were not affected by lime, mostly mineral pigments, could be added to the mix for the final finish coat. Stucco was also marbled or marbleized—stained to look like stone by diluting oil of vitriol (sulfuric acid) with water, and mixing this with a yellow ochre, or another color. As the twentieth century progressed, manufactured or synthetic pigments were added at the factory to some prepared stucco mixes. 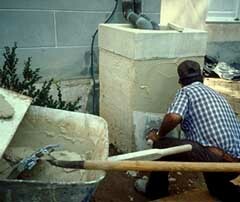 The dry materials must be mixed thoroughly before adding water to make the stucco. Photo: NPS files. Like interior wall plaster, stucco has traditionally been applied as a multiple-layer process, sometimes consisting of two coats, but more commonly as three. Whether applied directly to a masonry substrate or onto wood or metal lath, this consists of a first "scratch" or "pricking-up" coat, followed by a second scratch coat, sometimes referred to as a "floating" or "brown" coat, followed finally by the "finishing" coat. Up until the late-nineteenth century, the first and the second coats were of much the same composition, generally consisting of lime, or natural cement, sand, perhaps clay, and one or more of the additives previously mentioned. 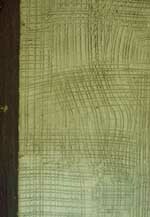 Straw or animal hair was usually added to the first coat as a binder. The third, or finishing coat, consisted primarily of a very fine mesh grade of lime and sand, and sometimes pigment. As already noted, after the 1820s, natural cement was also a common ingredient in stucco until it was replaced by portland cement. Both masonry and wood lath must be kept wet or damp to ensure a good bond with the stucco. Wetting these materials helps to prevent them from pulling moisture out of the stucco too rapidly, which results in cracking, loss of bond, and generally poor quality stuccowork. The deteriorated surface of this catch basin is being re-stuccoed. Photo: NPS files. Analysis of the historic stucco will provide useful information on its primary ingredients and their proportions, and will help to ensure that the new replacement stucco will duplicate the old in strength, composition, color and texture as closely as possible. However, unless authentic, period restoration is required, it may not be worthwhile, nor in many instances possible, to attempt to duplicate all of the ingredients (particularly some of the additives), in creating the new stucco mortar. Some items are no longer available, and others, notably sand and lime—the major components of traditional stucco—have changed radically over time. For example, most sand used in contemporary masonry work is manufactured sand, because river sand, which was used historically, is difficult to obtain today in many parts of the country. The physical and visual qualities of manufactured sand versus river sand, are quite different, and this affects the way stucco works, as well as the way it looks. The same is true of lime, which is frequently replaced by gypsum in modern stucco mixes. And even if identification of all the items in the historic stucco mix were possible, the analysis would still not reveal how the original stucco was mixed and applied. The stucco will be applied to the wire lath laid over the area to be patched. Photo: NPS files. The final finish coat will be applied to this scratch coat. Photo: NPS files. A stucco mix compatible with the historic stucco should be selected after analyzing the existing stucco. It can be adapted from a standard traditional mix of the period, or based on one of the mixes included here. Stucco consisting mostly of portland cement generally will not be physically compatible with the softer, more flexible lime-rich historic stuccos used throughout the eighteenth and much of the nineteenth centuries. The differing expansion and contraction rates of lime stucco and portland cement stucco will normally cause the stucco to crack. Choosing a stucco mix that is durable and compatible with the historic stucco on the building is likely to involve considerable trial and error, and probably will require a number of test samples, and even more if it is necessary to match the color. It is best to let the stucco test samples weather as long as possible—ideally one year, or at least through a change of seasons, in order to study the durability of the mix and its compatibility with the existing stucco, as well as the weathering of the tint if the building will not be painted and color match is an important factor. The new addition on the right is stucco scored to imitate the limestone of the historic building on the left. Photo: NPS files. The color of most early stucco was supplied by the aggregate included in the mix—usually the sand. Sometimes natural pigments were added to the mix, and eighteenth and nineteenth-century scored stucco was often marbleized or painted in imitation of marble or granite. 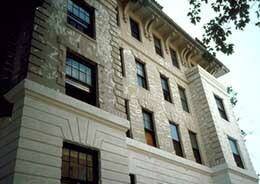 Stucco was also frequently coated with whitewash or a colorwash. This tradition later evolved into the use of paint, its popularity depending on the vagaries of fashion as much as a means of concealing repairs. Because most of the early colors were derived from nature, the resultant stucco tints tended to ne mostly earth-toned. This was true until the advent of brightly colored stucco in the early decades of the twentieth century. This was the so-called "Jazz Plaster" developed by O.A. Malone, the "man who put color into California," and who founded the California Stone Products Corporation in 1927. California Stucco was revolutionary for its time as the first stucco/plaster to contain colored pigment in its pre-packaged factory mix. Complete replacement of the historic stucco with new stucco of either a traditional or modern mix will probably be necessary only in cases of extreme deterioration— that is, a loss of bond on over 40-50 percent of the stucco surface. Another reason for total removal might be that the physical and visual integrity of the historic stucco has been so compromised by prior incompatible and ill-conceived repairs that patching would not be successful. This stucco house has a rough cast finish. Photo: NPS files. Historic stucco mixes varied a great deal regionally, depending as they did on the availability of local materials. There are probably almost as many mixes that can be used for repair of historic stucco as there are historic stucco buildings. For this reason it is recommended that at least a rudimentary analysis of the existing historic stucco be carried out in order to determine its general proportions and primary ingredients. However, if this is not possible, or if test results are inconclusive, the following mixes are provided as reference. 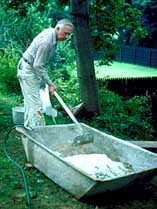 Many of the publications listed under "Selected Reading" include a variety of stucco mixes and should also be consulted for additional guidance. Lime should conform to ASTM C207, Type S, Hydrated Lime for Masonry Purposes. Sand should conform to ASTM C144 to assure proper gradation and freedom from impurities. Sand, or other type of aggregate, should match the original as closely as possible. Cement should conform to ASTM C150, Type II (white, nonstaining), portland cement. Water should be fresh, clean and potable. If hair or fiber is used, it should be goat or cattle hair, or pure manilla fiber of good quality, ½" to 2" in length, clean, and free of dust, dirt, oil, grease or other impurities. Rules to remember: More lime will make the mixture more plastic, but stucco mortar with a very large proportion of lime to sand is more likely to crack because of greater shrinkage; it is also weaker and slower to set. More sand or aggregate, will minimize shrinkage, but make the mixture harder to trowel smooth, and will weaken the mortar. Water to form a workable mix. Note: No portland cement is recommended in this mix, but if it is needed to increase the workability of the mix and to decrease the setting time, the amount of portland cement added should never exceed 1 part to 12 parts lime and sand. If hydraulic lime is available, it may be used instead of lime-cement blends. The same basic mix was used for all coats, but the finish coat generally contained more lime than the undercoats. Water to make a workable mix. Use WHITE portland cement in the mix in the same proportions as above. To color the stucco add not more than 10 pounds pigment for each bag of cement contained in the mix. The author gratefully acknowledges the technical expertise contributed to the preparation of this publication by Gilbert Wolf, National Plastering Industries; Walter Jowers; Brian Conway, Michigan Bureau of History; and master plasterer, Lawrence Ring, Sr. In addition, invaluable comments were provided by Michael Auer, Charles Fisher, Lauren Meier, Sharon Park, and Kay Weeks, professional staff of the Technical Preservation Services Branch, National Park Service; professional staff of the Cultural Resources program. Mid-Atlantic Regional Office, National Park Service; and S. Elizabeth Sasser of the Williamsport Preservation Training Center, National Park Service. Conway, Brian D. Illinois Preservation Series Number 2: Stucco. Springfield, IL: Illinois Department of Conservation, Division of Historic Sites, 1980. Grimmer, Anne E. Keeping it Clean: Removing Exterior Dirt, Paint, Stains and Graffiti from Historic Masonry Buildings. Washington, D.C.: National Park Service, U.S. Department of the Interior, 1988. Hodgson, Frederick T. Plaster and Plastering. Mortars and Cements, How to Make, and How to Use . . . with An Illustrated Glossary of Terms. New York: The Industrial Publication Company, 1901. Johnson, LeRoy, Jr. (editor). Handbook of Maintenance Techniques for Building Conservation in the Strand Historic District, Galveston, Texas. (Revised edition originally published in 1980 as Preservation Maintenance Handbook, prepared by Michael Emrick, AIA, for the Galveston Historical Foundation.) Austin, TX: Texas Historical Commission, 1984. Jowers, Walter. "Bungalow Building Materials: How to Repair Stucco. "The Old-House Journal. Vol. XIII, No. 4 (May 1985), pp. 8083. MacDonald, Marylee. Preservation Briefs 21: Repairing Historic Flat Plaster-Walls and Ceilings. Washington, D.C.: National Park Service, U.S. Department of the Interior, 1989. Mack, Robert C., AIA, de Teel Patterson Tiller, and James S. Askins. Preservation Briefs 2: Repointing Mortar Joints in Historic Brick Buildings. Washington, D.C.: National Park Service, U.S. Department of the Interior, 1980. McKee, Harley J., FAIA. Introduction to Early American Masonry—Stone, Brick, Mortar and Plaster. 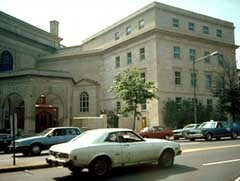 Washington, D.C.: National Trust for Historic Preservation and Columbia University, 1973. Matero, Frank G., Mary Hardy, Antonio Rava and Joel Snodgrass. Conservation Techniques for the Repair of Historical Ornamental Exterior Stucco. (With a Case Study for the Repair of the Cabildo Pedimental Sculpture). Report prepared for the Division of Historic Preservation, Office of Cultural Development, Louisiana Department of Culture, Recreation and Development by The Center for Preservation Research, Columbia University, New York. January 1990. Portland Cement Plaster (Stucco) Manual. Skokie, IL: Portland Cement Association, 1980. Van Den Branden, F., and Thomas L. Hartsell. Plastering Skills. Second edition. Homewood, IL: American Technical Publishers, Inc., 1984. Vieux Carre Masonry Maintenance Guidelines. Revised from the initial report prepared by Mary L. Oehrlein in 1977. New Orleans, LA: Vieux Carre Commission, 1980. Whitewash and Coldwater Paints. Bulletin No. 304G. Washington, D.C.: National Lime Association, 1955. Worsham, Gibson. "Exterior Plaster Restoration at the Lord Morton House, Lexington, Kentucky." Association for Preservation Technology Bulletin. Vol. XIII, No. 4 (1981), pp. 2733.